Disclosure: This post is sponsored by Netflix. I am a member of the Netflix #StreamTeam and I receive products and services in exchange for my monthly review. All ideas and opinions are 100% my own. The countdown to Halloween is on and it's officially less than one week away! That doesn't give us much time to fit in all of our favorite Halloween activities, but we're going to do our best! 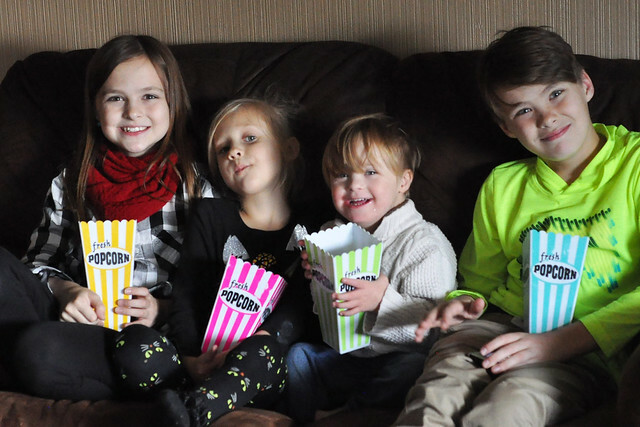 One of our favorite things to do to build excitement for an upcoming holiday is to gather together for Family Movie Night. We round up our favorite holiday episodes and movies and watch them together as a family. 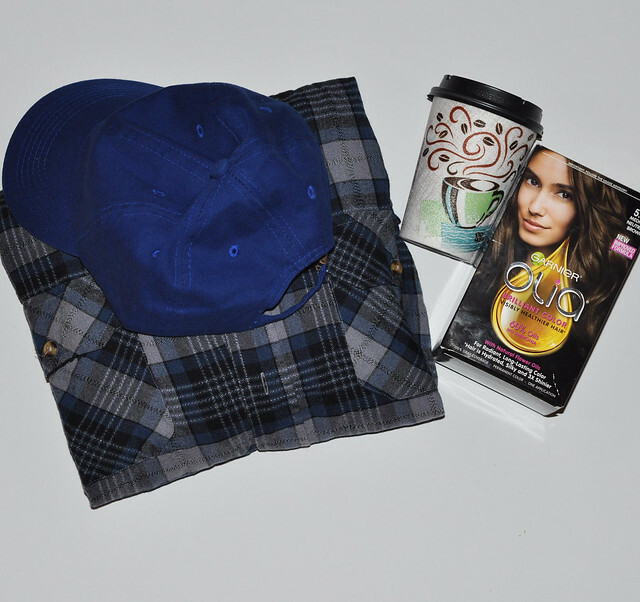 It's a great way to take a break from the chaotic hustle and bustle of everyday life and celebrate a holiday. Spending time together is what makes it so special! Our Sweet & Salty Halloween Munch Mix is quick and easy to make and satisfies the family members who crave salt and the family members who have a sweet tooth all at once! When I said it was easy, I really did mean easy! 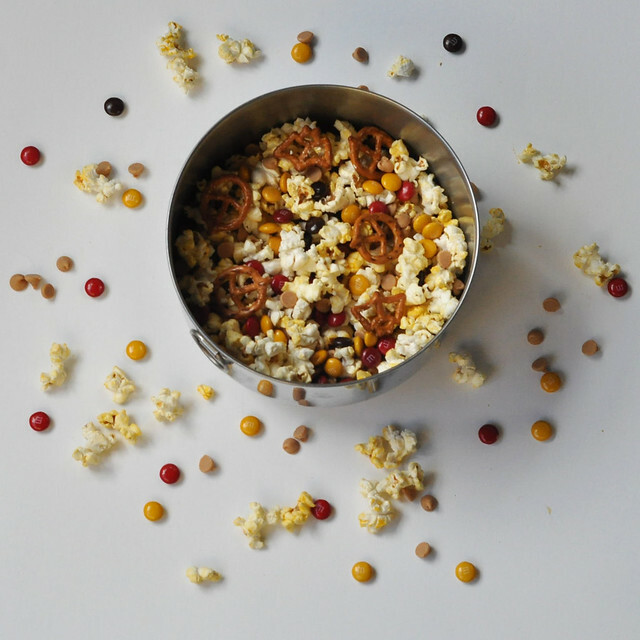 Pop the popcorn, empty the popcorn into a bowl then mix in all the pretzels, peanut butter chips and M&Ms. DONE! 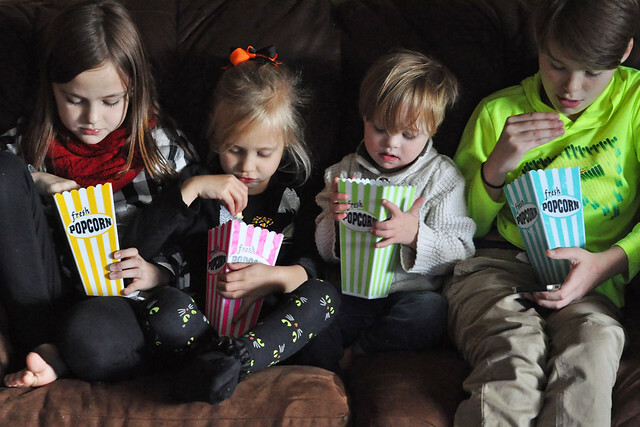 Mom Tip: Divide evenly into individual popcorn containers so there isn't any fighting over the popcorn bowl! Grab your popcorn and drinks, sit back and get ready for some Halloween entertainment! Although we have a lot of our beloved Halloween favorites on DVD we're also enjoying a Halloween watch list on Netflix! Netflix is an important part of our Family Movie Nights and adds to the holiday excitement. Things are getting spooky around here! Stay tuned for our Halloween recap coming up next week. I will be sharing our Netflix-inspired costumes along with Dylan, Lexie, Lily and Liam's costumes and wrapping up all the Halloween fun! 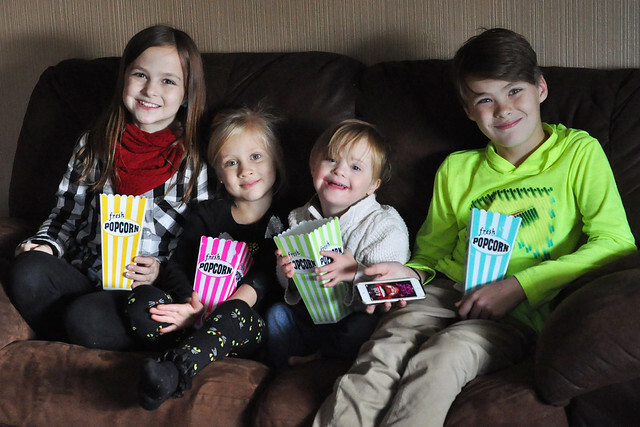 We soon will be eagerly counting down the days until that exciting premiere, but for now we're enjoying Halloween Family Movie Night with our little tribe! Delicious snacks, good ole Netflix and lots of cuddles. Happy Halloween! 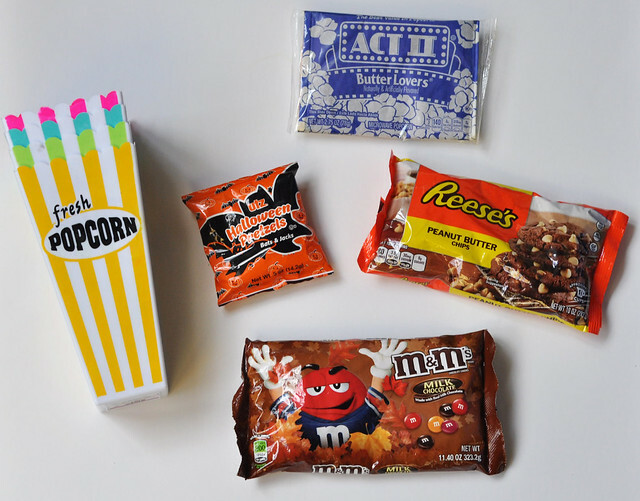 This looks like the perfect movie watching snack to me. Thanks for sharing the list too. I was just wondering what I could find on Netflix that would be new for the girls. Variations of this are my favorite movie treat. I like to just throw some m&ms or candy corn in there- so I like that this is a little more festive! Thanks for sharing! My boys just think candy comes with popcorn sometimes. I love the idea of mixing in the pretzels! Yum! We'll be doing lots of movies and snacks once it gets too cold outside! Loving that list of Halloween movies! We're always looking for new stuff for the kiddos and we love our Netflix! Ohhh this looks yummy! I love sweet and salty together. that popcorn mix sounds delicious! I will definitely be making for Halloween Eve! 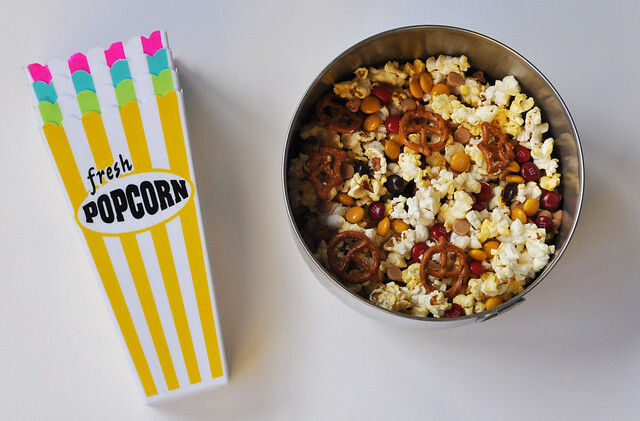 I am for sure making this for our next movie night! It looks SO yummy!! Gotta love netflix! The snack looks yummy! Oh goodness this sounds delicious! We have really limited screen time in our house, so movie nights are such a fun & special occasion. Love this! Will be a great time for our family. Loving that list of Halloween movies! Your post makes me have more ideas for this Halloween. Oh my gosh oh my gosh, I can't wait to see your costumes!! You guys are going to be so cute! 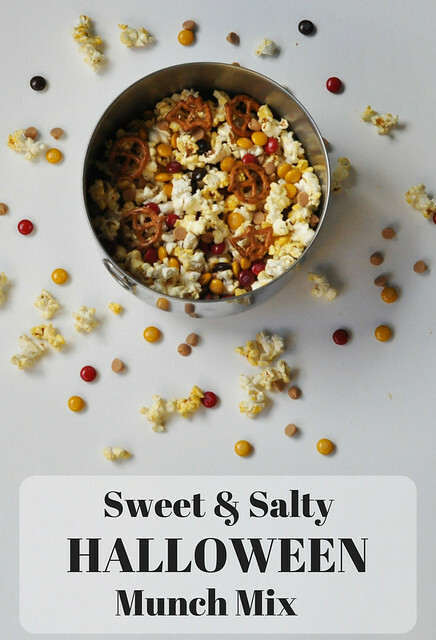 :) And this snack mix sounds yummy, I love just throwing the candy in with the popcorn for the kids, and the addition of the peanut butter chips is brilliant! They are so cute with their popcorn buckets! And what a great snack. I can't wait to see all of the costumes.